Riding in a group is a great way to meet new people, experience different routes and improve your cycling skills. Whilst many of our participants join in for the social side of things, there are also benefits to be had if you are someone looking towards improving your overall fitness and stamina or wish to get accustomed to riding in a group before tackling your first sportive or other cycling event. Whatever your reason, group riding will almost certainly ensure that you learn from experienced riders helping you to achieve your cycling goals. A roadworthy bike appropriate for the speed and distance of the ride. A full bottle and perhaps some gels/food if it is to be a longer ride. Appropriate clothing for the weather. Remember wind chill can be an issue when cycling even when it feels quite warm and if rain is predicted a roll-away jacket may prove useful. No open-toe sandals or flimsy shoes. Fully charged front and rear lights if riding in low visibility or at night. Emergency contact details either on your person or in a saddle-bag. Some cash for coffee and cake! All rides will begin promptly at the time indicated. Please arrive at least five minutes early to allow for any last minute changes or route information. All riders must be wearing a helmet. Safety is our primary concern on a group ride so please be prepared to accept advice and guidance from the Ride Leader. Unless specified, these are not training rides or competitive in any way. Ride together as a team, take your turn on the front if you feel able and look out for the others in the group. If you are struggling with the pace please communicate this to the other members of the group so that they may adjust the pace as necessary. Make other riders aware if you have a problem (mechanical, feeling unwell etc) and plan to stop or turn back and always let the Ride Leader know if you are dropping out of the ride. Try to ride in a straight line at a steady pace avoiding any sudden moves. If it is essential to overtake another rider or to stop or slow down suddenly please use clear hand signals and/or an audible warning. Where possible the group should ride in pairs (two abreast) and keep together. To allow cars to pass it may be necessary to form a gap or, when riding on very narrow lanes, to pull over and stop allowing the vehicle to pass safely. We strongly advise against waving a car on to overtake – let the driver to make that judgement him/herself. Be prepared to use hand signals or to call out to warn riders behind of an approaching hazard e.g. potholes, parked cars or debris on the road, giving those behind as much advance warning as possible. The call ‘car front’ should be used when a vehicle is approaching from the opposite direction. 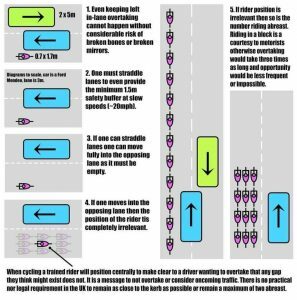 When riding at the back, make the group aware of any traffic approaching from behind with the call ‘car back’ or ‘coming through’ as it begins to overtake. Avoid riding too far off the front of the group at a pace higher than the one given at the beginning of the ride as this makes it difficult for the Ride Leader to keep track of the group. If you find yourself ahead of the group, e.g. when ascending a hill, please wait for the rest of the group at a safe place either at the top of the hill or at the next junction. Be vigilant to the riders all around you at all times and avoid overlapping the wheel of the rider in front at all costs.